You might have heard of many of the new green technologies that are starting to become better known in the UK heating systems market. Technologies like Heat Pumps, Solar panels and Renewable fuels promise to help cut not only the reliance on our limited resources of oil and natural gas, but also help to cut the utility bills of the home owner. Are these promises justified? Can the home owner save money by using these new technologies? 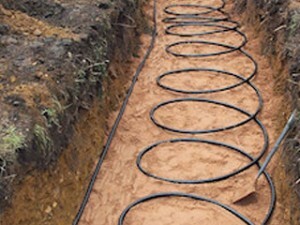 This article aims to look at one of the most prominent of the new technologies, Ground Source Heat Pumps. Ground Source Heat Pumps are very much at the vanguard of the modern heating technologies but how does it work? Well, a Ground Source Heat Pump works by pumping and circulating a mixture of water and anti-freeze around a loop which is buried under the ground at a depth of around two meters down. At that depth, regardless of the weather conditions at the surface, the ground remains at a more or less constant temperature. This loop is also called a ground loop. It can be laid in various ways, depending on the amount of land available and how much heat is required by the system. The longer the length the more heat that will be absorbed into the fluid that passes around the loop. The loop can be laid flat or coiled in trenches around the land, or in some cases depending on space, can be dug down vertically. As the fluid in the pipes passes through the loop it picks up the latent heat from the ground and absorbs it into the liquid. When the liquid returns to the Heat Pump it is passed through a heat exchanger. Because this heat is only the same temperature as under the ground it is considered low grade. This heat alone would not be enough to heat the property sufficiently. So when it is passed through the heat exchanger it is compressed which helps to make the liquid hotter and therefore able to be utilised in heating water for use in heating and hot water. The original fluid which is now cooler passes back into the loop to repeat the process indefinitely. Sounds easy? It is a surprisingly effective technology. It utilises the environment to generate heat and there is an indefinite supply. It can help to cut fuel bills considerably, especially if you are swapping from electric heating. It doesn’t require oil or gas fuels and it certainly doesn’t need much in the way of maintenance. What about the drawbacks? Let’s be blunt here. This is not an entirely ‘green’ technology. It won’t eliminate your use of utilities as it does require electricity to keep the unit running. It also doesn’t heat your property to the kind of levels that you have come to expect with traditional heating systems. Because the latent heat, even when passed through the heat exchanger, tends to be a lower temperature than with a standard system the radiators tend to feel warm rather than hot. This means during the coldest periods the heating system will have to run continuously to maintain the overall ambient temperature. The other factors which should be considered involve the level of insulation currently in the property. A Ground Source Heat Pump works best in conjunction with the correct level of insulation to supplement the heating system and to prevent the loss of the heat. The size of the land available is also a consideration as well as access for diggers that will be required to put in the trenches. The biggest drawback is the expense of installing a system. Installing a new Ground Source Heat Pump, along with all the associated works, is much more expensive that installing a modern standard boiler system. Estimates give the average cost as somewhere between £5,000 to £20,000. This will put it out of the reach of most home owners and at the moment it is not on any particular grant or subsidy scheme for home owners. By necessity retro fitting this on an existing building will be more expensive than installing this when a building is being constructed. So expect more new buildings in the future to start using this technology. If you are considering installing the system you should always consult with your local authority as to what permissions, if any, you might require. In time the costs will come down as the hardware becomes cheaper and more cost effective, but it will always remain at the higher end because of the labour intensive ground loops required. However, if you have the money and the option, then this is a great green technology to look at providing low cost and permanent heating and hot water, without the need to burn gas or oil.